NCDD Community News » How to improve the White House’s new e-petition tool? 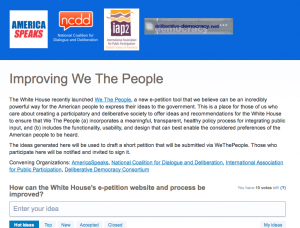 In tandem with the release of the US National Open Government Plan at the UN, the White House launched WeThePeople, an e-petition tool. AmericaSpeaks, IAP2USA, NCDD, and DDC are organizing a collective response from the American participation and deliberative democracy communities to offer guidance to administration officials on how it can be made as strong as possible. NCDD and organizations listed above set up an online suggestion box to aggregate our ideas on how the new platform can be approved. We invite you to check out the White House’s petition site and then suggest iprovements. For those who don’t know, the e-petition platform enable anyone (American or not) to create a petition articulating a specific policy the government should make or change, mobilize their community around that petition, and find support from others on the site. If a petition gets 25,000 signatures (it was previously 5,000) within 30 days, the White House will direct the appropriate policymaker to provide an official, public response. More importantly, we anticipate they will act on some of these most popular proposals. This new e-petition tool has the potential to become a significant and meaningful channel for the American public to offer input to the executive branch. The White House deserves a lot of credit for launching this powerful experiment in participatory government. But its success and impact depends on how it is implemented and integrated into policymaking and our broader political culture. We want the White House’s new forum to be as democratic, deliberative, and meaningful as it can be. Brainstorming: First check out WeThePeople, then offer your ideas about how to enhance it on our feedback site until October 31st. Synthesizing: From November 1st-7th, the top participants from the brainstorming phase will be invited to draft language summarizing the top ideas in a petition format using a transparent process on this page for collaborative writing. Publicizing: Finally, everyone who participates will be notified when the petition is live on the White House website so that they can sign it and promote it through their social networks as they see fit. When we reach 25,000 signatures, the White House will offer a public response — but even if we fall short of that goal, our consortium will deliver the message to the White House.Thanks for joining this important effort! Pretty impressed with the launch of this new service. Just out of the box, there’s lots to like. Still, I’m sure we can find a few things that could be improved down the road. Readers of this article might be interested in my related commentary on the Huffington Post: The White House’s New We the People Petition Website (see http://www.huffingtonpost.com/jh-snider/we-the-people-petitions_b_1004466.html). Previously, I had submitted three recommendations on the feedback website mentioned in the article above. Here is a petition to reform the We The People petition website. Others may also want to propose their ideas to reform We The People through the use of a petition. We petition the Obama Administra­tion to increase to 180 days the days allowed to get enough signatures (currently 25,000) for an official White House response. Currently, We The People only allows 30 days for gathering enough signatures to reach the 25,000 threshold to receive an official response. This was hard enough to do when the White House set the threshold at 5,000 signatures­. Now it is much harder. No good democratic rationale exists for such a rush: the quality of petitions does not increase as the time period allowed to sign them is decreased from 180 to 30 days. Instead, the shorter time period primarily disenfranc­hises a large part of the population that may need time to mobilize support. The democratic rationale for We The People should be simple: use new technology to allow politicall­y underrepre­sented groups to mobilize support. The short time period to gather signatures is incompatib­le with that purpose.